LED lights used in marine environments are highly prone to damage, due to persistent exposure to corrosive substances, such as saltwater. In order to address such concerns and prevent premature failure, industrial lighting manufacturers may apply robust coatings or finishes on the housing of the units. This article explores electrostatic finishes and their advantages for LED lights used in marine sites and other corrosive locations. A common finish for heavy-duty equipment includes the application of electrostatic paint. This type of finish comes with an electrical charge in the spray. Leveraging the law of attraction that exists when positively charged and negatively charged particles are present, the coating is able to effectively stick to the surface via an electromagnetic field. During application, the surface of the object receives a negative charge. The electrostatic paint takes on a positive charge, as it is administered to the surface using a spray nozzle. From a cost perspective, the special powder coat does not require numerous applications (minimal runs, overspray and drips as well), as initial coatings are capable of producing fusion-bonded finishes. In addition to corrosion resistance, outdoor equipment with electrostatic coatings can withstand light scratches and impacts. Compared to liquid paint, electrostatic layers are thicker, smoother and tougher. Metals and specific plastics are the types of materials that typically receive this type of finish. 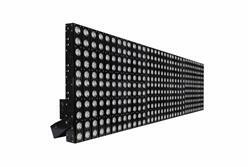 LED lights with electrostatic coatings are able to withstand chemicals and corrosion. The cutting-edge finish can be applied to light poles, mounts and other parts of the luminary to improve sturdiness. Outside of marine locations, electrostatic protection for lights is suitable in areas that experience frequent washdown, such as food processing plants, chemical factories and more. Equipment used in hazardous locations and harsh environments may also benefit from electrostatic finishes, which can increase the lifespan of lights, enclosures, switches, poles and etc.